As summer begins, we welcome the long days of sunshine, beach weather, and gorgeous produce. I love the camaraderie of backyard gatherings and grilling adventures. Summer brings a lot of great things like s’mores, bonfires, and the permeating aromas of barbecue, but it also brings major threats like forest fires. Every summer for as long as I can remember, the evening news has reported on yet another fire burning out of control and destroying thousands of acres of trees. Granted, fires are actually good for our forests because they promote new growth. Fun fact: There are species of Pine that need the heat of a forest fire in order to release seeds for new trees. Still, I think we can all agree that a wild fire burning beyond control is terrifying. So when a few of the lovely ladies in the office started talking about a herd of goats being led across San Francisco to help prevent such fires, I was engulfed in curiosity. These goats are the “latest innovation” in preserving endangered species in environmentally sensitive areas. 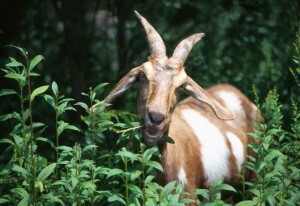 City Grazing reports that these animals munch up all the weeds and maintain vegetation growth without threatening the environment. Furthermore, a little research quickly showed that these herds are often hired to eat dry debris on the forest floors and lower the destructiveness of a forest fire. Cheers to an environmentally friendly way of managing vegetation! As an official B Corp, this is music to our ears. To celebrate, we thought this recipe for Goat Cheese Crostini would be the perfect light appetizer to any summer gathering. 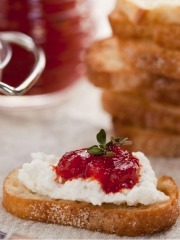 The slightly tangy goat cheese pairs surprisingly well with the mildly sweet tomato jam, and the flavors of each compliment each other for a savory treat!